Ankabut Users' Meeting 2016 was conducted in Dusit Thani Abu Dhabi Hotel in the 21st Nov. 2016, under the slogan "Read, Research, Innovate". Ankabut is working through this annual event on bringing the most knowledgeable researchers from all over the world, as well as leaders in the industry of innovative educational technology to explore these most important topics. The conference was one full day of technical sessions on cutting edge issues related to the industry, there were also many opportunities for networking and socializing with our partners. The event targeted around 500 for this free one-day meeting. 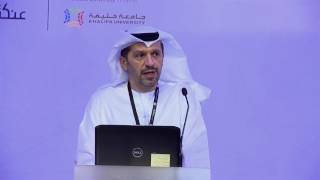 The attendees were primarily from the UAE higher education community and over 100 organizations attend including over 50 different post-secondary institutions. In addition to some government entities and senior officials as well as corporations who are involved in higher education. This is not just an event for the IT community but rather a gathering of multiple groups who share a common interest in educational technology.